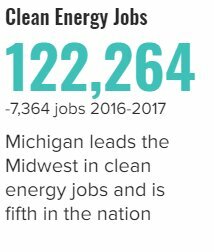 The Midwest is now home to 714,257 clean energy jobs, according to the 2018 Clean Jobs Midwest Report published by Clean Energy Trust and Environmental Entrepreneurs. Clean energy workers do a lot more than install solar panels and wind turbines — this industry includes energy efficiency workers, advancing technology for our electric grid, researching clean fuels, and figuring out ways to advance our transportation. There’s a strong case for business optimism for the industry, despite policy uncertainty. Across the region, renewable energy jobs grew by 5 percent over the last year. Midwestern clean energy employers have a positive outlook and project over 32,000 jobs will be added this year, a 4.5 percent growth rate. Here are a few of the top highlights for the Midwest: Illinois has the most renewable energy jobs in the Midwest. Michigan has the most clean energy jobs in the Midwest, with 122,264. Renewable energy grew 16.5 percent in Minnesota this past year – the fastest in the Midwest. Finally, Missouri is adding clean energy jobs faster than any other Midwestern state. You can read the full report for twelve Midwest states or see the results at a glance below. Read on to learn how many clean energy jobs are in your state! 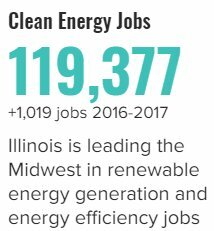 Illinois is home to 119,377 clean energy jobs and leads the Midwest in energy efficiency jobs (86,916, a 3.5 percent growth rate) and renewable energy jobs (16,956, 7.6 percent). By comparison, Illinois is home to just 31,821 fossil fuel jobs. Illinois has 8,633 wind jobs (up nearly 4 percent) and 5,222 solar jobs (down nearly 2 percent). Illinois has the most renewable energy jobs in the Midwest. The future is bright for Illinois, because the Future Energy Jobs Act puts the state on track to obtain a quarter of its electricity from renewable energy by 2025 and strengthen energy efficiency standards. This provides certainty to clean energy businesses, and job growth is expected to continue in the renewable energy and energy efficiency sectors. Read the full report about Illinois. 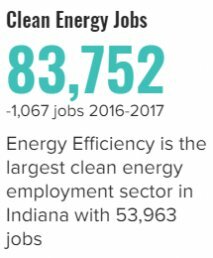 Indiana is home to 83,752 clean energy jobs. These clean energy jobs make up a 2.5 percent share of the state’s total workforce. Indiana’s clean energy employers project they will add more than 5,000 jobs in the next year, a 6.1 percent growth rate. Renewable energy jobs are the third-largest clean energy job sector in Indiana and grew 2.2 percent. This includes 6,549 wind jobs and 3,641 solar jobs. There are also nearly 4,000 advanced grid jobs, which are mainly focused in the energy storage industry. Read the full report about Indiana. 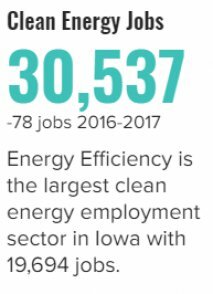 Iowa currently has 30,537 clean energy jobs in the state, most of which are in energy efficiency and renewable energy. In fact, there are 3,951 Iowans employed in wind energy (up 2 percent) and 858 in solar energy (up 15 percent). Wind energy is the dominant renewable energy sector in the state and grew 9.2 percent last year. With a 2,000 MW wind project being built between 2017 and 2019, one of the largest in the nation, there is a significant amount of wind development in Iowa – and that’s good for wind workers. Recent legislation was passed that could curtail investment in energy efficiency, which could lead to job losses in this sector over the next year. Read the full report about Iowa. Michigan has 122,264 clean energy jobs, leading the Midwest and placing fifth in the nation. However, due to federal policy uncertainty and economic trends, especially in the alternative transportation industry, there was a 5.7 percent decrease in jobs from 2016-2017. The renewable energy sector is the third-largest sector at 11,207 jobs. In the past year, renewable jobs increased by one percent and was the only clean energy sector in Michigan to add jobs. There are currently 5,532 solar energy jobs (6 percent decrease) and 4,736 wind energy jobs in Michigan (4 percent increase). Clean energy is going to play a bigger role in Michigan with each coming year by providing jobs to wind technicians in Gratiot County, employing factory workers in Detroit for advanced vehicles, and high-efficiency HVAC installers for school districts in the Upper Peninsula. Read the full report about Michigan. Minnesota is home to 59,079 clean energy jobs in every county of the state. The state added 1,522 jobs from 2016-2017, growing more than twice as fast as the overall state job market. In fact, clean energy employs six times more Minnesota residents than fossil fuels, and 40 percent of clean energy workers are employed in Greater Minnesota. Renewable energy was the fastest-growing clean energy sector in the state with 16.5 percent annual job growth – the highest in the Midwest. Renewable energy employs 7,241 Minnesotans, adding 1,026 jobs in the last year. Wind employs 2,088 Minnesotans (6 percent growth rate) and solar employs 4,496 (18 percent growth rate). Minnesota clean energy employers project they will add almost 2,700 jobs in the next year – growth rate of 4.6 percent. 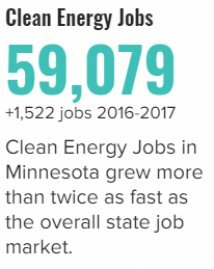 You can read more about Minnesota’s clean energy economy at the Clean Energy Economy MN website here, including job totals for every county, congressional district, and state legislative district. Read the full report about Minnesota. 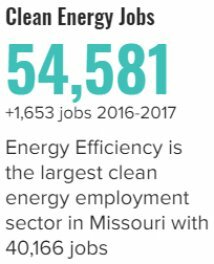 Missouri employs 54,581 people in clean energy jobs and added 1,653 jobs in 2016-2017. Renewable energy is Missouri’s third-largest clean energy employer, which grew 6 percent last year to 5,071 jobs. Solar energy employs 3,068 people but fell 3 percent from 2016 to 2017. Wind energy employs 1,130 Missourians and grew 9 percent. 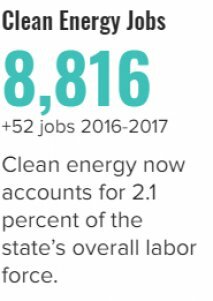 Clean energy jobs make up 1.79 percent of all jobs in the state, and clean energy employers in the state anticipate another 2.2 percent growth in the next year. Missouri is adding clean energy jobs faster than every other state in the Midwest. Read the full report about Missouri. North Dakota is home to 8,816 clean energy jobs, growing just under 1 percent last year. Of these, renewable energy jobs grew by 100 jobs, a 5 percent growth rate. Clean energy now accounts for 2.13 percent of the state’s overall labor force. Renewable energy is the state’s second-largest clean energy employer with 2,232 jobs and grew 5 percent in the last year. Wind energy employs 1,782 North Dakotans (2 percent growth rate) and solar energy employs 255 North Dakotans (2 percent growth rate). North Dakota’s clean energy jobs make up 2.13 percent of all jobs in the state, and North Dakota’s business owners project they will hire 0.6 percent more workers this year. The clean energy sector has performed well compared to North Dakota’s overall economy; clean energy grew almost 1 percent while the state’s job market shrunk by just under 1 percent. Read the full report about North Dakota. 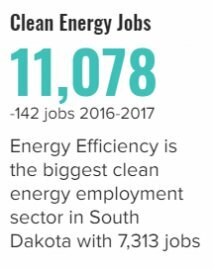 South Dakota is home to 11,078 clean energy jobs. Wind energy employs 1,513 South Dakotans and grew 2.1 percent over the last year. Solar jobs fell 4.6 percent due to federal policy uncertainty and expiring tax credits; 603 solar workers are employed in the state. In South Dakota, 10.6 percent of clean energy jobs are filled by veterans, which is much higher than the 6 percent national average. Jobs in renewable energy, energy efficiency, and more will continue to provide family-supporting careers across the state. Read the full report about South Dakota. 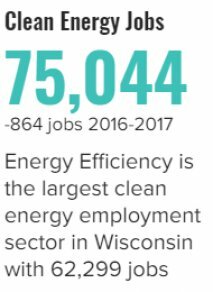 Wisconsin is home to 75,044 clean energy jobs, but faced a 1 percent decline over the past year due to uncertain federal policy. Clean energy employers in Wisconsin are optimistic and project to add 1,500 jobs in the next year, a 2 percent growth rate. Renewable energy is the second-largest sector for clean energy jobs in Wisconsin with 5,660. Wind jobs grew by 6 percent last year and now employs 1,549 people. Solar, however, declined 6 percent to 3,802 employees due to expiring tax credits and federal uncertainties. Clean energy jobs in Wisconsin range from manufacturing and construction to professional services and will continue to provide economic opportunity for thousands of Wisconsinites. Read the full report about Wisconsin.